You’re not going to find these vacuums on the centerfold ad of your favorite “Home & Lifestyle” magazine. You also might be wondering why you should even consider one of these vacuums in 2018. They aren’t going to win any awards, and you might even say they’re just kind of ugly. The thing is though, you don’t have to go buy a $400 vacuum to get a deep cleaning carpet vacuum that will last. That’s why we like these Panasonic uprights, and that’s why they’re still selling. This review comes down to two models: Panasonic MC-UG471 and the Panasonic MC-UG223. They’re both bag vacuums, the brushroll is belt drive, and there is no option to turn the brushroll off for bare flooring (hardwood, tile, etc.). If that turns you off, then read no further. Mini “Turbobrush” included for vacuuming upholstery. Why consider one of these Panasonic Uprights? The Panasonic MC-UG471 (Red) is our recommended model because of it’s HEPA Media filter, auto cord rewind, 15″ wide cleaning path, dual edge cleaning, and upholstery brush. Both models use the same bags and belts. In terms of raw carpet vacuuming performance, you’re not going to be able to tell a difference. They’re both nearly exactly the same, but the MC-UG471 has those helpful additional features. These vacuums do their job well. When it comes to simply removing pet hair, dust, and dirt, it’s hard to find a better performing vacuum. MC-UG471 (Red) is relatively heavy at 20 lbs. No bare floor option on either model. (can’t turn off brushroll). Not recommended for very thick rugs. Majority of the stated attachment reach, 10 ft, is due to the two extension hoses that are rigid plastic. These work just fine if you’re trying to reach cobwebs in wall corners or get in crevices around furniture. However, the rigid hoses aren’t maneuverable inside a vehicle, for example. You won’t have much trouble using the mini turbobrush on a couch, but you won’t be able to easily vacuum your car seats and feet area. The MC-UG471 is somewhat heavy to push around, but the MC-UG223 (green) model is the lightest at 14 lbs. For most people, this won’t even bother you, but if you’re older and have a large area to vacuum then you might consider going with the lighter model. The lack of a bare floor option is disappointing, but these vacuum carpet so well it’s hard to hold it against them. You can still get in crevices around your kitchen cabinets or other appliances, but plan on using something else for your bare floor rooms. One caveat about the auto height adjustment is that it doesn’t handle very thick rugs well. Assuming it doesn’t immediately break your brushroll belt, it will put a lot of strain on it. Even the Miele Dynamic U1 vacuums aren’t so great on thick carpet. These vacuums are truly meant to clean carpet. Your typical household medium-pile carpet is really where these vacuums shine. Bare flooring (hardwood and tile) aren’t ideal either. There’s no way to turn off the motorized brushroll, so you will likely end up throwing things around rather than picking them up. 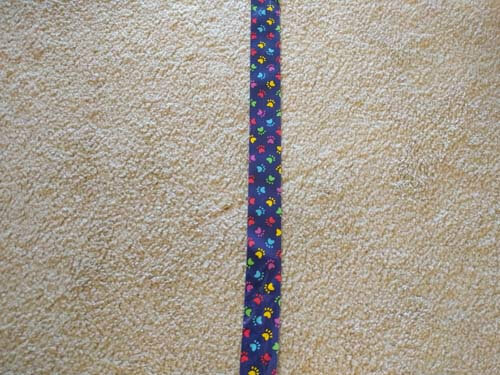 Most people report no issues when vacuuming their plush carpet, but this depends on the length of the carpet fibers. 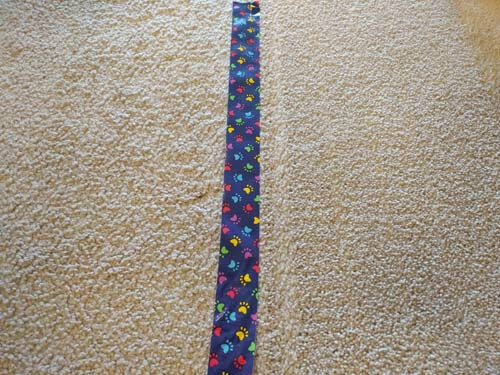 Longer plush carpet will be more difficult for any vacuum. Just do a little testing. With that said, the carpet cleaning performance of these is second to none. Lately, I’ve been using a Miele Classic C1 Olympus with the Turbobrush cleaner head on typical medium-pile carpet. Going over the carpet again with the MC-UG471, made the carpet look and feel like brand new. The turbobrush isn’t representative of the capabilities of a Miele vacuum, but this is just meant to give you something to compare to and demonstrate why we insist on having an electrobrush cleaner head for Miele canisters intended for use on carpet. The MC-UG223 (Green) performed exactly the same as the MC-UG471 (Red), so that’s a boring comparison. However, the MC-UG471 does get closer to the edge on both sides of the cleaner head. This also speaks to the great performance you can get from these low cost Panasonic vacuums. After one pass from each vacuum. As you can see, the agitation from the Panasonic vacuum is stronger, as expected. The turbobrush is only driven by air and only brushes the top of the carpet, whereas a motorized brushroll will agitate all the carpet fibers and loosen up deep dirt, dust, and pet hair. The MC-UG471 (Red) comes with a HEPA Media filter while the MC-UG223 (Green) comes with a typical electrostatic filter. Again, this is where the MC-UG471 pulls ahead and makes it a great bang for your buck. Filtration is one of the most important features of a vacuum, as it determines how much dust and allergens make its way back into the air you breathe. The HEPA filter is an exhaust filter, so pictured above the air will be coming towards you out of the filter. 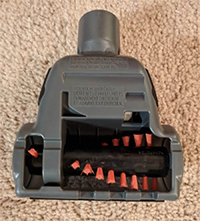 This makes it extremely easy to see how this vacuum is performing, since the entire front compartment would start to accumulate dust if their was a significant leak in the system. There’s no indicator as to when you should change the HEPA filter, but it’s a good idea to check it after emptying 3 to 4 bags. The HEPA filter is also fairly cheap, but you could shake it off and get some more life out of it. If you start noticing any decrease in suction power, then that’s a good time to check the filter and check for obvious clogs in the piping entryways in the cleaner head or around the hose. This is an impressive filter system at this price point. 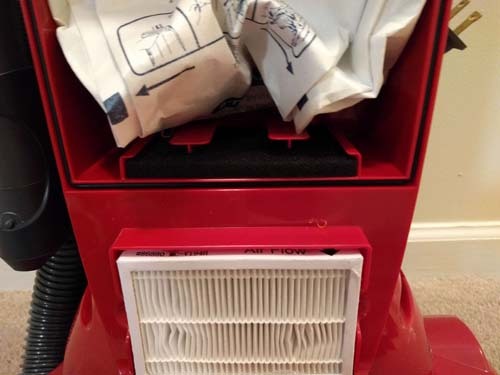 It’s not a Miele, but this is a super affordable alternative if you like the cleanliness of a bag vacuum and a decent filter system. Fits the Panasonic MC-UG471 (Red) Upright Vacuum. Fits both the Panasonic MC-UG471 (Red) and MC-UG223 (Green) Upright Vacuums. These vacuum bags are very low cost, and at the time this article was published they were about $0.73 per bag. This is certainly cheap compared to the Miele Type GN bags which go for around $3.50 as of this article’s publication date. Miele’s bags are thicker and contribute a lot more to the filter performance of their vacuums. As for belts, these are super low cost and you may not ever need to change your for years. If you accidentally vacuum up a blanket or something large that can get lodged in the cleaner head, then you’ll probably cause the belt to snap. But for normal use, with no accidents, you can expect to get years from a single belt. The MC-UG471 (red) comes with the air-turbine tool, in addition to the crevice tool and dusting brush, that can be used to vacuum your upholstered furniture. The MC-UG223 (green) model does not come with any tools other than the crevice tool and dusting brush. 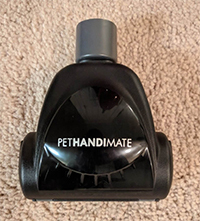 This tool is driven by the airflow through the hose and works well for pulling pet hair off of furniture. It’s also a good tool for cleaning rugs if they’re too thick to be vacuumed with the primary head. Many vacuums don’t even include a mini turbobrush and will sell it as an addon, so this is another reason this vacuum is a great buy. For the small price difference between these two vacuums, it’s an easy decision to go with the Panasonic MC-UG471 (Red). The additional air-turbine tool helps for cleaning furniture, stairs, and vehicle seats. The HEPA is another cost and something that will need replacing, but we think the extra filtration is worth it. You can buy filters from a third party, which are significantly cheaper and seem to perform just as well. 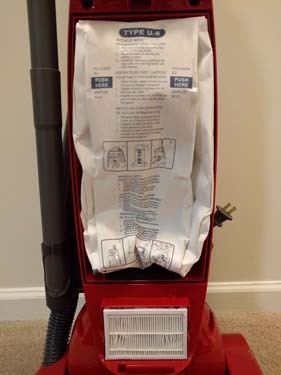 If you like no nonsense bag vacuums, then consider this Oreck Commercial style vacuum. No attachments or hose on this vacuum. It automatically adjusts to your carpet or bare floor. Powerful brushroll, 40 foot cord, and affordable bags make this a great option if you just need a simple vacuum that performs. I recently bought the red one. It’s a little heavy to push around but I’m getting old. I agree that it vacuums carpet really well but I don’t recommend it for tile. I also went with the off brand hepa filter.